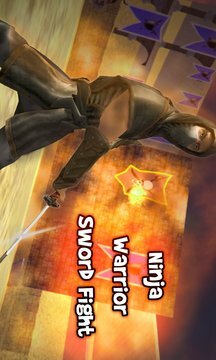 Ninja Warrior Sword Fight is a fast-paced ninja fighting action game in gladiator arena. Ninja warrior has to fight against trained evil arena gladiators and barbarians. You are a trained arena ninja fighter whose duty is to make reputation and return with glory. 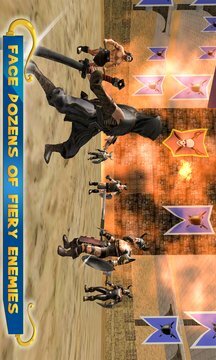 Face lots of challenging adventures with enemy having lethal weapons. In this sword fight game, attack like shinobi ninja with his shuriken and katana sword. Samurai ninja is famous for slashing enemy with fast agility in combats with his blade and shuriken. In such feudal times use your ninjutsu skills and master the art of stealth. You are trained in modern hand to hand assassin combat and guerrilla warfare techniques along with martial arts to show at the gladiator arena. Beware of movements because enemy forces are angry, violent and ready to kill assassins. Rise as swordsman, feel the rage-filled inside you; destroy your enemy clan with katana sword.